I’ll be riding in the rain come Monday and probably for the next several days. I’m not much of a rain rider, but when it comes to commuting, I’ll do it unless the rain is accompanied by strong winds. My rain gear is, in a word, PVC, or polyvinyl chloride. I have been reluctant to spring for a $100 jacket with “Gore-tex®” properties. I may do that soon and, if I do, I’ll write a report. I’ve read many accounts of how well they work, so I’m not so much doubtful as I am cheap. It doesn’t rain all that often in Northern California. What I do recommend is fenders. You can live with a lousy rain jacket, but riding without fenders is dirty business. 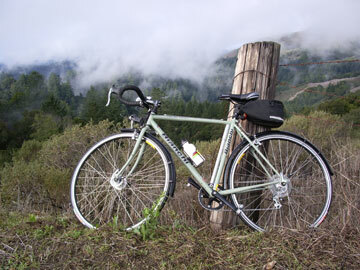 My rain bike is the Bianchi Castro Valley, so named because Bianchi has a U.S. office near that Bay Area community. The bike was a decent value at $750 when I bought it in 2005. It has a dynohub so I don’t need to worry about light batteries, but the bulb can burn out. A flickering LED serves as backup. I’ve ridden this bike into the Santa Cruz Mountains, in addition to commuting. It has plenty of gears for hills. I can’t say I’ll ever enjoy riding in the rain, but it’s all part of being a bike commuter. This entry was posted on December 7, 2009 at 1:37 am and is filed under Products. You can follow any responses to this entry through the RSS 2.0 feed. You can leave a response, or trackback from your own site.